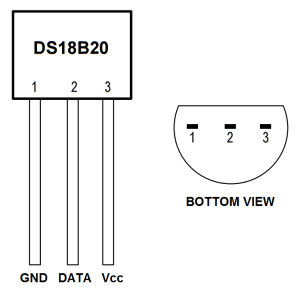 Vcc should be connected to any of the 5v or 3.3v pins of Raspberry pi (PIN : 01, 02, 04, 17). Gnd should be connected to any of the Gnd pins of Raspberry pi (PIN : 06, 09, 14, 20, 25). Login to Raspberry pi using putty or any other linux/unix terminal. After login, open the /boot/config.txt file in your favourite browser. Now add the this line dtoverlay=w1–gpio to the end of the file. Now reboot the Raspberry pi sudo reboot. Now you will found out a virtual directory created of your temperature sensor starting from 28-********. Now there is a file name w1-slave, This file contains the temperature and other information like CRC. cat w1-slave. # We will read after ignoring first two character. # Now normalise the temperature by dividing 1000. Above python module will print the temperature vs address for infinite time. RATE parameter is defined to change or adjust the frequency of temperature query from the sensor.